The Nokia 808 PureView comes with an old, but capable phonebook, which can easily be synced with your Exchange account. Contacts can be ordered by first or last name. You can also set whether the contacts from the SIM card, the phone memory and the service numbers will get displayed. Setting some of your contacts as favorites moves them to the top of the list. Editing a contact offers a great variety of preset fields and you can replicate each of them as many times as you like. You can assign personal ringtones and videos to individual contacts. If you prefer, you may group your contacts and give each group a specific ringtone. If you have duplicated contacts (e.g. one from the SIM card and one from Exchange) you can merge them, similar to how it works on competing OSes. A really nice touch when editing a contact is the option to enter their address by locating it on a map. The social network integration includes Facebook and Twitter, which should be fine for the vast majority of users. You can see the latest status update right from the contact info - or at least the first three lines of it. A tap on it brings you to a new screen where you can read the whole message and you get options to view the sender's profile and more updates . That takes a few seconds though as the Social app needs to load first. Reception on the Nokia 808 is good and we didn't experience dropped calls. The phone features an extra microphone for active noise-cancellation. The dialer also supports video calls. The dialer is smart dial-enabled, so you just punch in a few letters from the desired contact's name and select it from the list that comes up to initiate a call. There's speed dial too on the virtual dial pad. The final option for starting a call is via the shortcuts you can place on your homescreen. Voice dialing is also enabled; it gets activated by pressing and holding the call key. It is fully speaker-independent and, as far as we can tell performs admirably, recognizing all the names we threw at it. In noisier environments though, its effectiveness might suffer. The Nokia 808 has the neat accelerometer-based feature that lets you mute the ringer by turning the phone face down. That same turn-to-mute trick also works for snoozing the alarm. Thanks to the proximity sensor the screen is automatically disabled during a call. The Nokia 808 PureView took our traditional loudspeaker test scored a Good mark. More info on the test, as well as other results can be found here. All your incoming messages arrive in a shared inbox and by default are displayed in threads. If you're old-school, you can view choose the folder view mode too. 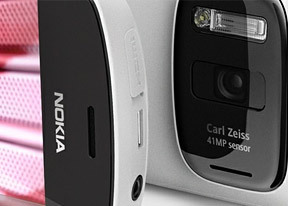 The Nokia 808 PureView relies on a shared editor for all the types of messages. Stuff like a character counter in SMS goes without saying. Insert some multimedia content and the message is automatically transformed into an MMS. In that case, the character counter turns into a data counter showing kilobytes. The Nokia 808 automatically set up our Gmail account in no time, complete with Exchange Active Sync configuration. Usually, all you need is to enter a username and a password and you will be good to go. A few settings had to be entered manually for the Active Sync setup. Multiple email accounts and various security protocols are supported, so you can bet almost any mail service will run trouble-free on your Nokia 808. Messages can be sorted by various filters such as date, sender, subject, priority or even by attachments, search is enabled as well. The email client can be set to automatically check mail at a given interval. For that you get two separate settings: syncing frequency and peak and off-peak sync times. There is also support for attachments, signatures and basically everything you would normally need. The on-screen keyboard of the Nokia 808 PureView works as we've come to expect out of a modern smartphone. The 4" screen is big enough and the virtual keys have plenty of padding around them, making typing easy. The landscape mode offers bigger keys and you can activate word auto-completion, both of which speed up typing. Text auto-correction can be set between high, medium or off. Text fields fully support cut, copy and paste functionality. You can just swipe your finger to highlight some text and a popup shows up automatically to access those features.